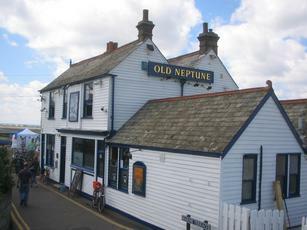 Anyway, the Whitstable Pale went down well, and I must admit that this pub is, if anything, even woodier than the Kings Arms in Oxford, and I don't mind being wrongly blamed for spoiling a quiz question either. 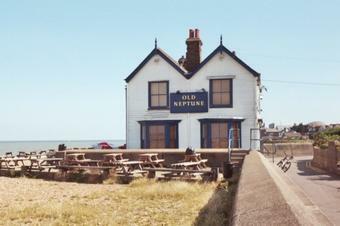 Enjoy going here to sit out on the beach with a pint of Harveys Best. Bands on Sundays can make the place very lively. The clientele are a colourful lot! We eight entered and I said "Hello" to the lady behind the bar. She said "Are you going outside?". I found that to be an original response. "No" I replied and she got the drinks. My companions said "We're going outside"
I said "I think that you should speak to that lady about that". They did, and they ended up buying eight plastic glasses into which to transfer our drinks. We watched the sun set over the bay and forgot about that. 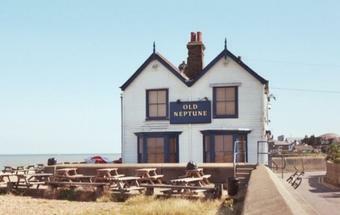 An old fashioned feel to the pub with bare floorboards, uneven in places and lots of nautical artifacts spread around. The artwork is more modern and added to the charm. The pub is practically on the beach and there are planty of picnic tables on the shingle which are very popular in the Summer. Not a wide selection of real ales but with Harveys on that doesn't matter! The clientele is mixed and the staff are friendly. Bands play on Sunday aftenoons. The day I was there We Ghosts were on and I can recommend anyone to catch them if they are in the area. All told a very enjoyable time wa had!